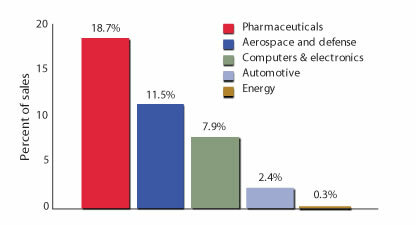 Among major industries, energy companies spend the smallest portion of their sales on research and development. For example, American pharmaceutical companies spend 60 times more of their revenue developing new products than U.S. energy companies. Public and private investments in science, engineering, and commercialisation have led to dramatic reductions in the cost of solar power. 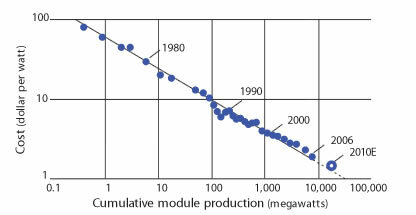 Costs have historically decreased 22 percent for every doubling of cumulative capacity. For most of the past 30 years, investment in energy research, development, and deployment has been in decline. U.S. energy companies, for example, spend less than 1 percent of their revenue on research, and the federal government allocates just $5 billion per year, far less than Americans spend on cat food. Today, however, there is a growing recognition that energy research, development, and deployment of new technologies must be dramatically increased. Breakthroughs in clean technology would improve urban air quality, enhance energy security, and permit billions of people to improve their standard of living without dumping CO2 into the atmosphere. Energy innovation also holds the promise of dramatically lowering the cost of attaining a 2°C climate target, saving the world a trillion dollars or more over coming decades. The economic benefits of low-carbon technology – tens of millions of jobs and burgeoning new markets – are enormous. The European Union believes that an 80 percent reduction in greenhouse gas emissions, the goal of its Roadmap 2050 plan, is the winning strategy for long- term prosperity. The recent Chinese move into the clean energy sphere has also been impressive. Long a leader in solar water heating, China has now become a dominant player in wind and photovoltaics as well. Worthy research objectives include improved fuel cells, solar power, light-emitting diodes for lighting, intelligent buildings, carbon sequestration, advanced nuclear power, superconducting transmission lines, cellulosic biofuels, geothermal power, batteries and other energy storage technologies, super-efficient vehicles, and smart electricity grids. Because the scale of the climate challenge is so large, energy innovations must be paired with bold policy initiatives designed to accelerate the deployment of new technology and to reduce its cost. European “feed-in tariffs,” which guarantee a profitable selling price for renewable energy, have led to a dramatic expansion of the solar and wind industries in Portugal, Spain, and Germany. In 2009, Germany installed 17 times more solar power than did California. Germany is investing strategically, with the aim of increasing its job base and expanding its exports, while driving solar costs down. Historically, each doubling of solar module sales has led to a 20 percent drop in price, putting solar on a path to be as cheap as coal.